Sometimes things in the genealogy world happen so fast that I really need to stop, take a deep breathe and analyze what is happening. We are all excited to make connections with new cousins. I was thrilled do have a comment left for me on my blog May 6, 2015 from what I found out later was a new cousin. She saw her grandmother's name in my blog and wanted to know if I had any information about her. This cousin unfortunately never had an opportunity to meet her grandmother. We had a couple of conversations and before I knew it I was emailing with her father, my third cousin once removed. He is working on his memoirs and offered to share with me after he did a corrections check through out. In the meantime my cousin in Washington and another in Montana and I are sharing information with our new cousins in Colorado! It is so exciting! "My" Swedish Adventure ~ Förbereda (Preparing) Links to posts 1-10 can be found here. "My" Swedish Adventure~Resan (The Trip) Links to posts 11-20 can be found here. "My" Swedish Adventure~Resan (The Trip) Links to posts 21-30 can be found here. I know Erik Söderlund was born in Indalsliden, Sweden. He came to the United States in 1899, when he was about 32 years old. Erik lived in the United States applying for an emergency passport in April 1917. At that time he was 48 years old and was spending a month in Sweden. I know he lived in Verndale, Minnesota. Verndale is not far from Wadena, where other family members are from. Verndale and Wadena are almost smack dab in the middle of the state. Now, I wonder when he actually settled in Verndale and what did he do for a living? Time to look at some censuses. 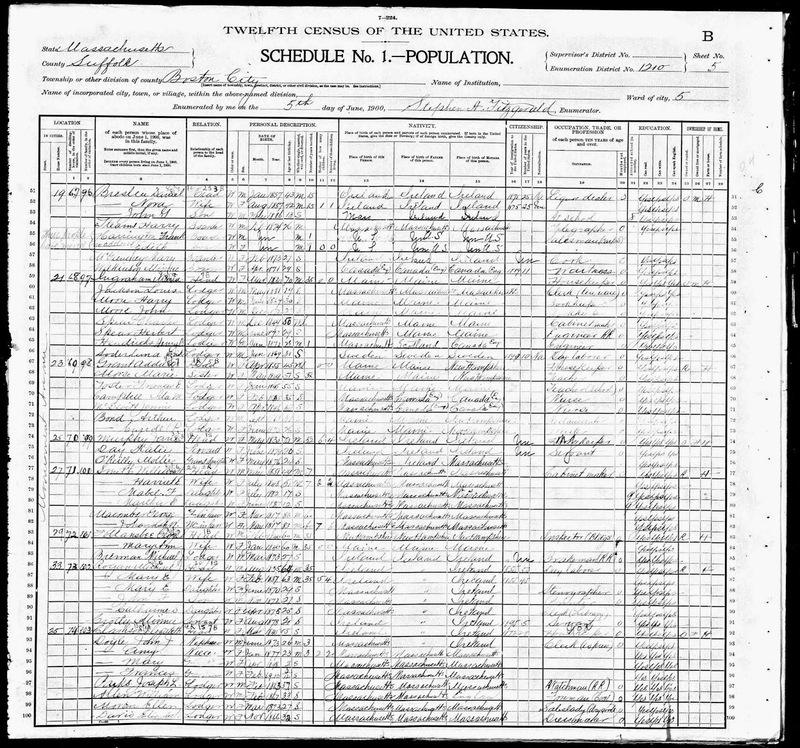 I found "Erick Söderlund" (notice the spelling) in Boston City, Suffolk, Massachusetts in the 1900 census. At the time, Erik was a lodger, 31 years old. He worked as a day laborer who could read, write and speak English. Of course, his parents and he were from Sweden. But is this really my "Erik Söderlund?"